PAKISTAN (ANS – Nov. 23, 2018) — The family of Asia Bibi, the Christian woman who spent eight years on death row in Pakistan for blasphemy before being acquitted three weeks ago, claim they are being hunted by extremists going house to house with their photographs to try to track them down. 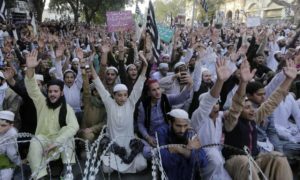 Demonstrators protest against the release of Asia Bibi. According to a report in The Guardian newspaper, Bibi’s family have been in hiding since her acquittal by the country’s supreme court. She is in protective custody as part of a deal between the government and a hardline Islamic party, under which violent protests were called off while a review of the court ruling was undertaken.